You are here: Home / Movies / Action / Mars Attacks! Tim Burton practically defines the word eccentric. His movies run the gamut from goofy (Ed Wood) to contemplative (Big Fish) to freaky (Charlie and the Chocolate Factory) to downright odd and well-nigh unclassifiable (Edward Scissorhands). 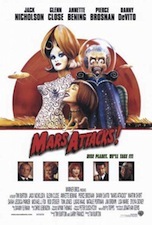 Mars Attacks falls more in the latter category, even though it is first and foremost a pretty spot-on good-old-fashioned parody. The subject of Burton’s lens in this film is 1950’s sci-fi, with its themes of paranoia, alien invasions, American superiority, and national wonder at what awaits us in the great unknown of outer space. Mars Attacks! begins with several vignettes introducing a wide swath of caricatures characters ranging from the President of the United States to a self-absorbed TV fashion reporter to a washed-up prizefighter waiting tables in Vegas. But before you can say “baby needs a new pair of space boots,” giant flying saucers from Mars have landed on the planet with aliens who have seemingly come in peace. As you might expect, though, things are not what they seem and pretty soon the aliens are blasting everyone in sight with their ray guns that turn people into red and green skeletons. No explanation is given, nor is one really needed, and for the next hour and a half it’s basically humans vs. aliens in an all-out global battle for survival. Every character is an overwrought cartoon, which is part of the fun, and anyone who tries to take this movie seriously is missing the point. The idea of a martian invasion is just a canvas for Burton to weave some seriously weird yet downright heartwarming tales of idealism, heroism, and big-headed aliens with ray guns that turn people into green skeletons. Mars Attacks! has all the subtlety of a cinder block, and flaunts it proudly: Martians land on earth in giant flying saucers and start shooting ray guns at everyone. The military wants to nuke ’em. The academic elite wants to study them. The hippies want to make peace with them. And the reporters want to interview them. Characters are as dispensable as their accents, and the special effects would be laughably cheesy if that wasn’t how they were supposed to be. Pierce Brosnan playing (what else?) a brilliant British scientist. Perhaps it’s a coincidence that this movie was released in 1996, the same year as another alien invasion movie you might have heard of called Independence Day. But where Emmerich’s bombastic blockbuster was about two sizes too big for its britches, and took itself a little too seriously, Mars Attacks! gets everything just about right. Even the aliens, with gigantic heads and a language that consists solely of barking out the words “Ack! Ack!” are a pitch-perfect sendup of the oh so realistic extra terrestrial creatures in Independence Day, Close Encounters, E.T., and so many other science fiction films. Of course the best reason to see Mars Attacks! is Jack Nicholson as the President (as well as a seedy Las Vegas businessman) and easily one of the funniest roles of his career. Hamming it up at every turn, chewing the scenery like it was freeze-dried ice cream, and flashing his signature condescending grin every chance he gets, it’s a role only he could have pulled off with such overwrought tongue-in-cheek delivery. It’s a sight to behold. Mars Attacks! is blisteringly funny and bitingly sarcastic, but it does have its share of flaws too. The lack of any coherent storyline is a bit of a drag, and it is somewhat frustrating that we never really find out why the martians have attacked in the first place. But any movie in which Sarah Jessica Parker’s head is glued to a chihuahua is OK by me.